Baptism is a sacrament (holy ritual to symbolise grace) in the Christian tradition that is traced back to Jesus himself being baptised in the river Jordan. We are delighted that you are thinking about getting your child baptised (christened) at St Thomas à Becket’s Church. It is such a natural response to God for His gift of new life. There are one or two practical considerations to think about first. If you live in the parish of Pagham then you are entitled to get your child baptised at St Thomas à Becket’s. We baptise children on Sundays either at our main service at 9.45am or at a ‘stand alone’ baptism service at 12noon. 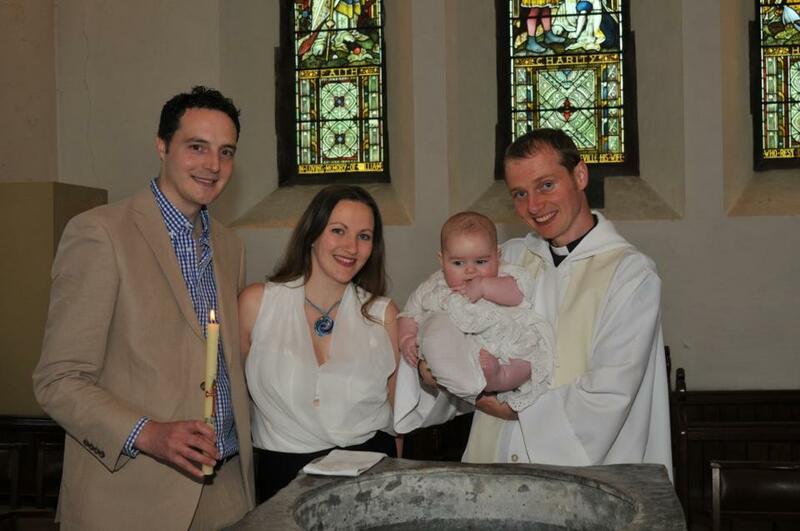 Sometimes more than one child will be baptised at the same service. There is no charge for baptism: to become a born again child of God is a free gift. It is useful to think about suitable godparents for your child. They must be themselves baptised (preferably confirmed) because otherwise they would not be able to make major religious promises on behalf of your child which no one has ever done for them or they for themselves. The final thing to say is that baptism is the start of a wonderful lifelong journey with God, Father, Son and Holy Spirit, which does not cease at death, and so you are always welcome to worship on Sundays, not least as we have an excellent Sunday School. Worship and fellowship will help you and your child learn more about God, about yourselves and about God’s loving-purposes for your lives. At St Thomas à Becket’s we admit baptised children to communion after a short course when they are around 9 years of age. Confirmation marks the point in the Christian journey where those who have been baptised as children make a firm and public commitment to Christian discipleship. There is no exact age for this because it must be when the individual young Christian is ready to take this step. For most, however, this would be during the early to middle teenage years. Again, they would follow a course of preparation for confirmation – this could either be with other young people or with adult candidates. It’s never too late to give your life to God! If you weren’t baptised as a child you might be wanting to explore your beliefs, faith, way of life and we would be delighted to help you on this journey. For adults, baptism is usually the first stage leading on to what we call confirmation: a service led by the bishop where you make your own promises and which leads on to the receiving of holy communion (the bread and wine, body and blood of Christ). The Vicar leads annual adult confirmation classes.